Nigeria’s strategically significant military base at Baga, near the border of Chad, fell to Boko Haram in a clear rout for the multi-national force stationed there, who apparently put up no resistance. Boko Haram razed at least 16 villages in northern Nigeria, leaving 2,000 people unaccounted for and feared dead since Monday, Nigerian officials said Thursday. Borno state lawmaker Ahmed Khalifa told NBC News that “towns are just gone” and that the the villages along Lake Chad are “covered in bodies.” The village attacks reportedly began after militants seized a key military base and chased residents out of the area. After clearing the villages, they returned to kill survivors and burn down town structures. Boko Haram […] controls an estimated 30-35,000 square kilometers, roughly the same amount of terrain as Syria and Iraq’s Islamic State. It’s pretty telling about U.S. priorities, over-reactions, and under-reactions in different parts of the world that the response to ISIS last year was sharply different — which is to say, not even on the same scale of magnitude — from the response to Boko Haram, even as they now control the same land area by size. Mass executions by ISIS in Syria and Iraq have so far reportedly topped out at 700 people in a two week killing spree (although the total figures across incidents over the past year are significantly higher). If the civilian body count estimates coming out of north Borno state in northeast Nigeria prove correct, Boko Haram will have already significantly exceeded the August 2014 massacres by ISIS. Keep in mind, however, that public official/government reports on the insurgency in Nigeria have often proven greatly exaggerated or altogether false, and information coming out of the Baga area is likely to be very sketchy at best right now. At minimum, though, the intensity and frequency of Boko Haram’s attacks on military and civilian targets (especially near the border regions) appear to be picking up steam. 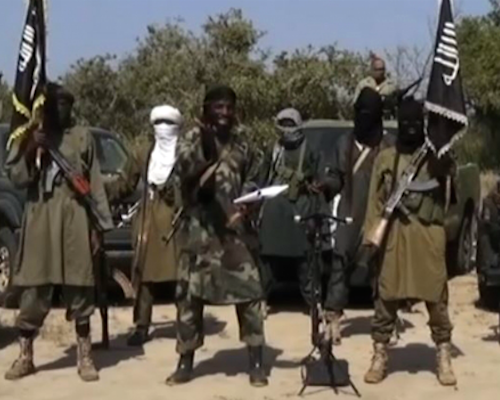 “The human carnage perpetrated by Boko Haram terrorists in Baga was enormous,” Muhammad Abba Gava, a spokesman for poorly armed civilians in a defense group that fights Boko Haram, told The Associated Press. He said the civilian [self-defense] fighters gave up on trying to count all the bodies. “No one could attend to the corpses and even the seriously injured ones who may have died by now,” Gava said. Soldiers from Niger had been there [at Baga base] but were not present when it was attacked. Niger Foreign Minister Mohamed Bazoum told the BBC Hausa service: “We have 50 soldiers there and decided to withdraw them after Boko Haram captured Malamfatori town in October and continued to operate in the area with impunity. “As you know, Baga is under [the control of] Boko Haram terrorists and unless the town is recaptured from them, we will not send back our troops. Still image (via AFP) from a Boko Haram video communiqué received October 31, 2014. Tagged Africa, Boko Haram, Borno, Nigeria, terrorism, war crimes, West Africa.